This recipe is barely a recipe since it uses prebought or premade ingredients. But it gives me a good opportunity to wish you all a happy new year … and to share a couple of holiday photos. 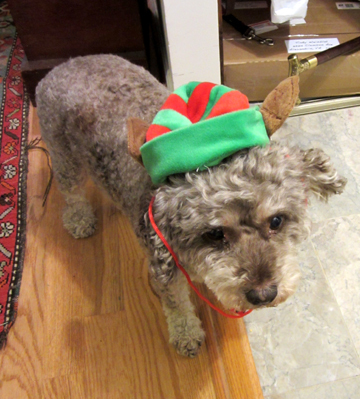 had a lovely holiday season. 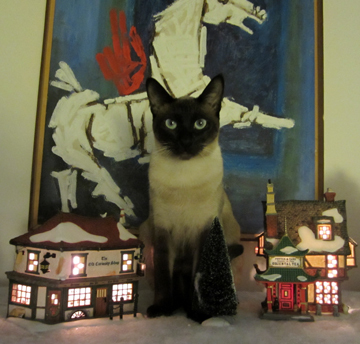 Miss Ruby in particular was taken with our small but sturdy Christmas tree since she hadn’t seen one before. Luckily, the tree was in my sunroom (separated from the rest of the apartment by a handy door) so she didn’t manage to dismantle it. Leigh and David, my sister-in-law and brother, invited me to a New Year’s Eve party. I decided to try to replicate a baked brie with cranberries I had purchased earlier in the season at Whole Foods Market. I mixed up the flavors a bit by using my cranberry-chipotle sauce for the filling, adding a little zing to the rich brie. Leigh and my nephew Michael helped me cut the puff pastry for the brie, and we baked it at their house so it would be warm for the guests. Now that the new year has struck, of course, I’ll be eating more healthily. So I have a feeling that combining sugar and carbs and fat as I did here will be rare. Still, the brie makes a lovely memory. Here Leigh puts the egg wash on the wrapped brie. In a small bowl whisk together the egg and water. Slice the brie in half horizontally. 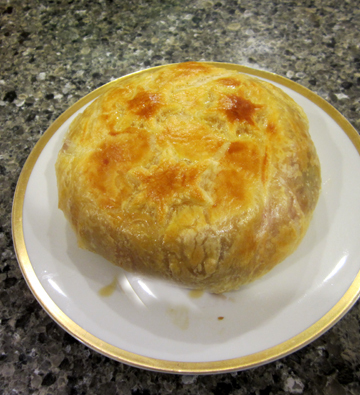 Lay the first round half on the puff pastry, rind-side down. Spread the 1/4 cup of sauce on the cheese. Top with the other half of the cheese, rind side up. 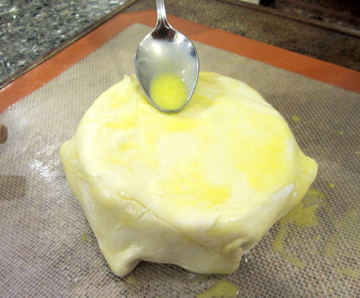 Wrap the pastry around the cheese, sealing the creases with the egg wash. Turn the cheese over. Lay the decorative pastry on top, and brush the whole thing with egg wash.
Place the cheese, seam side down, on a baking sheet lined with parchment or a silicone mat. Bake the brie until it turns golden brown (about 15 to 20 minutes). Let it cool for a few minutes before serving. Serve on crackers and/or fruit with additional chipotle sauce in a side dish. Serve 6 generously. This entry was posted on Wednesday, January 9th, 2013 at 4:00 am	and is filed under Appetizers, Cranberries, Holiday Foods. You can follow any responses to this entry through the RSS 2.0 feed. You can leave a response, or trackback from your own site. 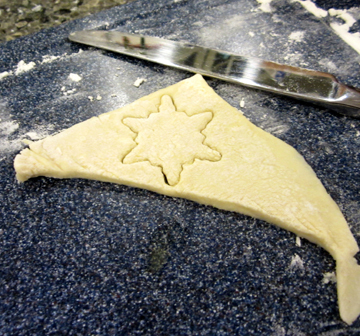 Love the dough-star at the end…or is it a snowflake? Chipotle sounds good. I made one w apples and cranberries. I like the splitting in half idea. Definitely a snowflake, Cara. I I like the apple idea, too, Cynthia! Thank you! It was fun, that’s for sure. mmmmmm – that looks delicious! It was indeed–but definitely a tad rich! since brie is a favourite of my son-in-law and because I was going there for New Years dinner I took this treat along. It was a big hit with him and my grandson who was also there. Between the two of them they almost totally ignored the lovely prime rib and ate the whole cheese. He now has the recipe and plans on taking it to his father’s for dinner the next time he goes there. Since I am allergic to peppers I could not partake, but I was glad the boys enjoyed it so much. Thanks for such a treat! I’m glad it was a hit. And I’m so sorry about your pepper allergy. Still at least you had the prime rib–yum! !